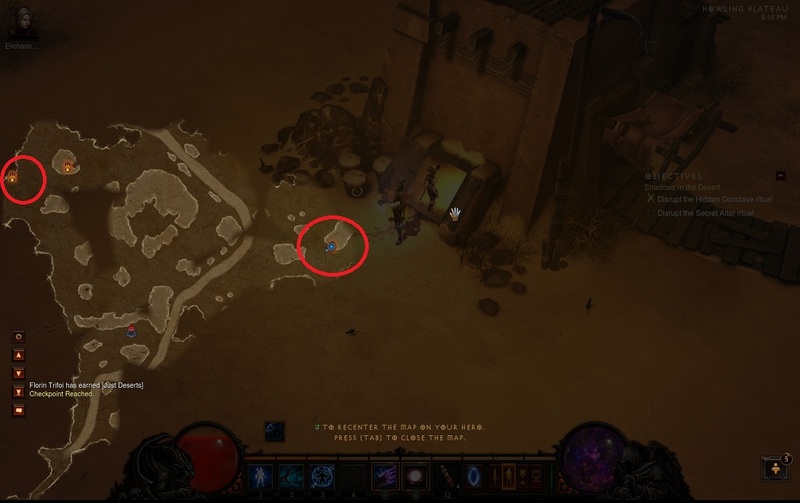 When you first get out of Caldeum, the city of the Act 2 of Diablo 3, you need to find and interrupt two rituals found in the area called the Howling Plateau. For these you need to find the entrance in the Hidden Conclave and in the Secret Altar. After that you need to defeat the cultists that are trying do do some kind of dark ritual. All you have to do is to enter in those huts or whatever they are, and clean them up. At this quest you will be followed by the third follower from Diablo 3, named the Enchantress. She can detect the illusions that Belial followers are making to deceive you, because you know, he is known as the Lord of the Lies. After you find and interrupt the Hidden Conclave ritual and the ritual from the Secret Altar, you need to go a little further the the Enchantress will ask you if you want her to become your follower. Note that this is only available when you play solo. As the lore is concerned, you find out that the Enchantress is 1500 years old and she was in a stasis spell until now. I hope you find the Secret Altar and the Hidden Conclave easily.